That did not take long at all. 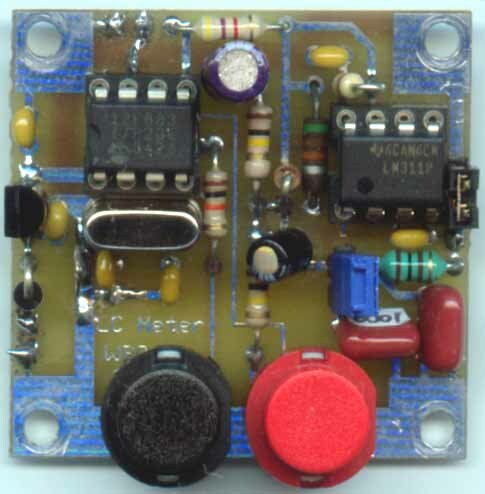 I soldered in all the components on the Jackson Harbor Press LC meter kit tonight. I will have to stop by Radio Shack tomorrow and hopefully, I will be able to buy a set of clip leads. I will solder these to the board and they will allow me to test capacitors and inductors. If the Shack doesn't have any, I will more than likely fabricate my own using some of the alligator clips that I bought at the hamfest a few weeks ago. I also need to stop by the grocery store to buy a 9V battery to power this meter up. It's Murphy's Law that you never have one in the house when you need one! The other thing that I need to pick up tomorrow is that can of Krylon clear spray. There's a Home Depot right across the street from where I work. They open at 6:00 AM, so if I leave the house a few minutes earlier tomorrow, I can pop in there on my way to work. I am off from work on Friday for Good Friday; and the weather is supposed to be sunny and in the 70s, so it looks like superb outdoor spray painting weather. After this, I am not sure what I will tackle next; but I have plenty to pick from. PS: John AE5X - what did you do for yours with regards to an enclosure? is the Jackson Harbor Press LC Meter kit. Since I can't continue with the PFR3A until after I get the housing all clear coated to protect the decals, I have decided my next project will be the LC Meter kit. As it turns out, a quick visit to the Jackson Harbor Press website shows that this little kit has been discontinued. I'm glad I got one while they were still available! Fortunately, I can still download all the documentation and will do that later on tonight. Looks like this little kit will take an evening. Regarding the PFR3A and the clear coating, the manual says to use Krylon clear matte; while several friends have told me that they have used a glossy finish with no problems. I will either go glossy or perhaps satin finish, if I can find it. Personally, I think a matte finish would take away from the bright yellow housing. The weather here in the Northeast is still quite unsettled with lots of heavy rain. This is supposed to clear out of here some time tomorrow and leave us with fine weather for the upcoming Easter weekend. I am sure I will get my three coats of clear coat done this weekend, which will permit me to finish the PFR3A next week. I had a nice conversation on the way home with one of the newer members of the repeater club that I met briefly last Friday evening. He told me that his interest in Amateur Radio grew out of his interest in 4 wheel drive off roading. He also informed me that a lot of off roaders out West are getting their tickets and are making use of VHF and UHF repeaters and frequencies. Hey, whatever! If it brings in more Amateurs, then it can't be a bad thing. This new Ham, in particular, is fascinated by the other facets of the hobby that he is discovering. He came in thinking that VHF/UHF was going to be his niche, only to find that he can't wait to get on HF and the possibility of world wide communications. Satellite communications are also whetting his appetite to get deeper into the hobby. I told him that Amateur Radio is like a smorgasbord - lots of tasty dishes to try out and enjoy! The original PFR3 came with a silk screened enclosure. I don't know this to be the "Gospel truth"; but I am assuming that the PFR3A enclosure was manufactured without the silk screening in an attempt to keep the kit's cost down. As a result, the PFR3A comes with a sheet of decals which you have to apply. I did this tonight; and the picture above shows the result of my effort. The decals went on easy enough; but you can tell they are decals and not factory silk screening. According to the manual, I will have to apply three coats of clear matte Krylon spray to make the edges of the decals disappear and look seamless. The weather forecast for this coming Easter weekend is sunny with highs on Friday and Saturday supposed to be reaching the mid to upper 70s. So I suppose I will have good spray painting weather and will be able to get this done. I pray that I don't louse this up. It's so easy to spray too heavy and cause drips and runs. I will have to be super careful. I've taken this much time to build this kit, I guess a little more time won't kill me. But I'm rounding third and headed for home and I'd really love to get this baby on the air! More good news on the PFR3A front. I attached up the coax connector to the circuit board and hooked up my OHR WM-1 Wattmeter and a 50 Ohm dummy load in order to fire up the transmitter to see the power out. At first, my heart sank as I saw NO power out. My first thought was, "Oh no, not MORE problems !!!!" Then after a few quick thinking moments, I realized that it had been a while since I had last used my WM-1. I opened the case and took out the 9 Volt battery and metered it to find out that it was below the 7 Volt level. After replacing the offending battery with a fresh one, my eyes were greeted by the pleasant arc of the meter's needle headed towards higher ground. Of course, I got results just the opposite of what the manual says, but I am pleased nevertheless. The manual states that when the PFR3A is hooked up to a 12 Volt battery, that you can expect "about" 5 Watts out on 40 and 30 Meters, and "about" 4.5 Watts on 20 Meters. On 40 and 30 Meters I am getting between about 4.5 Watts out (maybe a little less as the WM-1's markings are not the greatest at max. 10 Watt setting). On 20 Meters, I am getting the full "gallon" 5 Watts out. I have spread the windings on the coils for 40 and 30 Meters as far and even as I could and the results that I am getting are fine, as far as I'm concerned. I suppose I could remove a winding from each of the coils to bump that up even farther; but I won't. When I operate my K1 or K2, I usually keep the power at about 4.7 or 4.8 Watts as a matter of course. So I can deal with 4.5 Watts out in a heartbeat. The battery issue in the WM-1 was what inspired the development of the WM-2, I believe. The WM-2 allows you to power up from either a battery or a wall wart. That's a nice option and would have saved me a few anxious moments; but I'm not about to replace my WM-1. Getting back to the PFR3A, I guess that I can now say that I am 90% complete. All that is left is the installation of the enclosure decals and the subsequent "clear coat" and then the final chassis wiring. I might take on the task of enclosure decals tomorrow night. Boy, this takes me back to my model airplane and space model days! I hate to jump the gun; but I think my next project will be the Jackson Harbor Press LC Meter that I picked up a few months back. 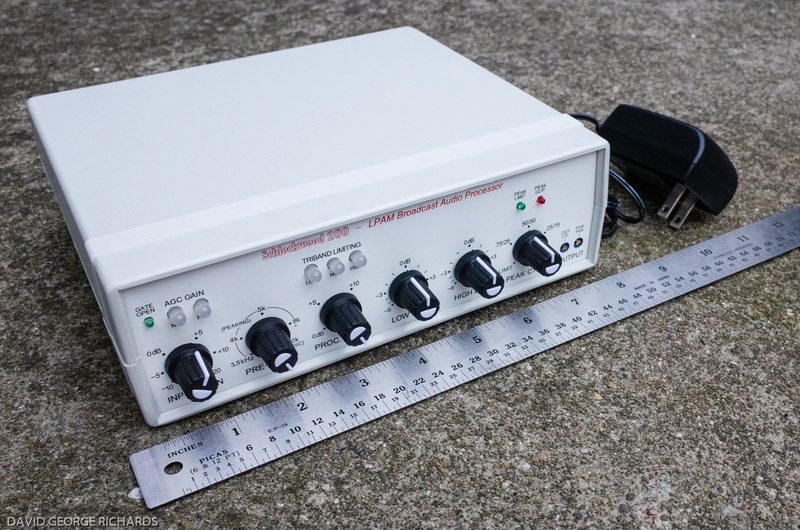 I would like to concentrate on building a few pieces of test gear; in order to make building and more importantly, troubleshooting a little easier. By the way, I discovered that my little Polaroid digital camera will allow me to do some simple videos. Once the "little yellow box" is 100% complete, I will take a video of it in action and will post it here. Another outdoor adventure from Jim W1PID. SSB, no less, too! 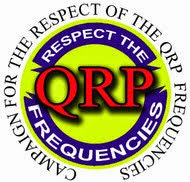 This should make any QRP skeptics have second thoughts! This morning, before leaving for Cara's last cheer leading competition of the year, I did manage to get to Greenbrook Electronics. I purchased a spool of 24 gauge magnet (enamel coated) wire for what I consider to be the outrageous price of $22.50 plus tax. But, it's a lifetime supply, so I'll never have to buy more. This evening, after dinner and all else had calmed down, I did manage to rewire T3 and get it soldered in. The PFR3A recommended leaving T3 a little "up and off" the circuit board as the transformer sits right above one of the slide switches. I did that, but since I'm paranoid, I also managed to wedge in a small piece of electrical tape over the switch pins so there's no chance of accidental contact. Tomorrow evening, I will hook up the BNC connector and will attach my Oak Hills Research QRP Wattmeter and a dummy load to see how much power I am getting out. After that, the biggest "challenge" will probably be to get the decals mounted on the enclosure without butchering anything up. Once the decals are mounted, it will be time to protect them with several coats of clear lacquer or polyurethane. Since warm weather will be on its way soon, that will be done outdoors to minimize the possibility of asphyxiating myself. You know, when I was having so much trouble with the receiver section, I silently swore to myself that I would never purchase anything from Hendricks QRP Kits again. I may have to eat those words as I an seriously thinking of purchasing the RF Probe/Tracer-Injector combo. Two nice little tools to have at my disposal. There's an article on QRP operating on e-Ham. It was first published in 2006 and was chosen for a "rerun". It's a good, basic article. But what seems to be more important is that the article so far has gotten positive feedback. I'm still waiting for the QRP Bashers to come in and start up with the snide comments. Hopefully that won't happen. Sometimes I get inspiration for ideas for these blog posts at the oddest moments. The one for this came while shaving this morning and thinking about last night's "Senior" incident at the fish dinner. At the repeater club meeting, I was one of the younger Hams there. There were a lot of true "Seniors" there. But while they may be up there in years, it was amazing to listen to these guys talk to one another. If you walked into that meeting room with me, your first impression might have been, "Great! Another bunch of "Old Farts" (a term I hate, but see used a lot on places like e-Ham). But as it turned out, nothing was farther from the truth. These guys were all sharp as tacks and were amazingly "up" on today's technology. The main talk of the evening concerned linking the club's 220 MHz repeater with another local club's 400 MHz repeater, which offers IRLP and Echolink links. Listening to these old timers discuss links, nodes, super reflectors and other such IRLP and Echolink topics kind of surprised even me. These are not the type of guys who sit on 75 Meters or 20 Meters grousing about "kids, lids and space cadets". And the way they treated a few newcomers was equally eye opening. The "Welcome" mat was extended big time! There were four newcomers, two attending their first meeting and two attending their second. One was in his 50s, one probably his 30s and it looked like two were in their 20s. They were fussed over and were really made to feel welcome and important. Attitudes sure have changed! I remember my first meeting at this club many years ago and how I sat quietly waiting to be talked to. So I sit here, thinking about the articles I've read about how our hobby is dying and that we're a bunch of old fogies who hate young people and anything new. If you came with me to this repeater meeting last night, you'd have definitely walked away with the notion that such articles are very stereotypical and not based on reality. Well, not in this case, anyway. This story has NOTHING to do with radio. Well, almost nothing; but my wife and I got a kick out of it, so I am going to relay it here. A little background. I belong to Sacred Heart Roman Catholic church here in South Plainfield. I also belong to the local Knights of Columbus Council here in town. Every year during Lent, we have a community fish dinner each Friday. The proceeds go to help the church and school. If you're a Knight and you help with the dinner - either by cooking, or cleaning up, you get a discounted dinner. Today, I couldn't stay to help clean up as I normally do. I had a radio club meeting tonight (see, there is a tiny little bit of radio involvement here). When I entered the school building, I told Gene, a brother Knight, who was taking admission money that I was paying "full boat" as I couldn't stay to help with clean up. I gave him a $10 dollar bill and expected to get $2 in change, as regular price is $8. He gave me $3 back. I handed him a dollar back and said, "Gene, you gave me too much, I should only get $2 back." He looked at me and said in a real serious tone, "I charged you the Senior Citizen price". Oh boy! I know I have a lot of gray hair; but I didn't expect that! Anyway, even at $8, this is a good deal. You get your choice of fried or baked fish (flounder) or fish parmigiana. Your side dish is a choice of french fries, macaroni and cheese, or ravioli. You also get cole slaw, a salad, bread and butter, coffee, tea or a soft drink and dessert. Really generous portions and a lot for your $8. The repeater club meeting went well. It was the first one Ive been to in a long time; and it was nice to see some old familiar faces, as well as the chance to meet some new folks. The repeater was recently located to a new site and tower and the coverage is looking like it is going to be significantly better. Since the Piscataway club is now defunct, I think I will try to make a regular appearance at these meetings in order to keep in touch with the local Ham population. A lot of PARC members are also members of this club. I could just kick myself !!!!! Finished winding T3 for the PFR3A; and did a great job, if I say so myself. Now I get to do it all over again, because I cut the leads too darned short and they wouldn't reach the circuit board holes on one side! Now I have to go to the electronics store on Saturday morning to purchase some 24 gauge magnet wire. There's not enough left to completely rewind T3. I've been building kits since 1979; and here I go and make a rookie mistake. Just goes to show you, lose concentration and even experience can't help ..... sometimes. I began winding T3 tonight, the last component to be soldered to the PFR3A circuit board. I say that I began winding it, as I was too tired to finish. It was a pretty crappy day at work which left me pretty much mentally exhausted. I re-read the procedure for winding the rest of T3 and it doesn't look as bad as I thought it was going to be. I should be able to finish it tomorrow night (assuming tomorrow is a better day at work) and get it soldered in. Hopefully, my ability to keep focused will be better tomorrow night. The latest issue of CQ came today. Inside was K4TWJ's final QRP column. Cam Hartford N6GA takes over for Dave and his regular QRP column will begin with the June issue, if I read right and remember correctly. While K4TWJ will be a tough act to follow, I am convinced that Rich Moseson, the editor of CQ, knows exactly what he is doing and has found the perfect successor for Dave Ingram. I wish Cam all the luck in the world; and hope he'll be churning out a good QRP column for CQ Magazine for many years to come. 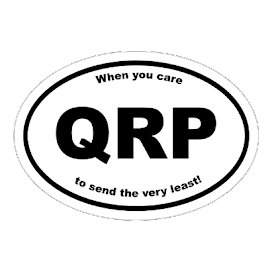 A gentleman, Fred AC8ED recently posted to QRP-L about his "First week as a "real" QRPer". It is always interesting to me to read how folks get their starts in things, why they do this, how they came about to be such an avid ..... whatever. It makes me ponder how we all, as a Ham community, got our start. What EXACTLY is our fascination with radio? Why didn't we become coin collectors, or stamp collectors, or butterfly collectors, or model railroad enthusiasts, or 1,000 other "whatevers". Some of also are those other things, of course; but I think the majority of us would list radio as our first and foremost passion. And I think we all get a kick out of reading how our fellow Amateurs got their start. How did you get yours? For me, it all started at a young age, in the early 60s. I was given a crystal radio as a gift. It was in the shape of a pen (fountain pen). You would hook the alligator clip to ground (I always used the metal "finger stopper" on our old rotary telephone) and you would put the earphone in your ear. Then you would slide the pen "tip" in and out to tune stations. I remember WOR and WMCA and WABC and WCBS coming in loud and clear - we lived only 35 miles from NYC. I was also hooked on playing around with the radio portion of my parent's old Victrola. It had that green "Magic Eye" tuning device; and I remember listening to police calls and shortwave broadcasts. I loved tuning the bands with it and making that heterodyne "squeal". From there I got my first AM/FM "transistor radio" when I was nine. It had a telescoping antenna, which I thought was the greatest thing since sliced bread, and I would have hours of fun tuning those "in between" stations to see how far away I could listen. I loved playing with old radios that people were ready to throw out. I would play with the inductors and potentiometers, to try and get the reception louder and clearer, if I could. Their trash was my treasure. Of course, serious SWLing came next, along with a little dabbling with CB came and went in the mid 70s. The silliness and unruliness of CB quickly turned me off; but the fascination with SWLing remained. Real "Amateur Radio" with its structure and discipline was what I craved and in 1978, I finally earned my ticket and reached my goal. But again, why the fascination with radio in the first place? Many reasons, I guess. It satisfies my urge to tinker, it satisfies my craving for science. It satisfies my desire to use my hands to build things. It allows me to talk to people all over the world without depending on a telephone or cellphone. It fulfills my sense of adventure, taking a small radio and a portable antenna out into the Great Outdoors to see just who I can make contact with. Radio continues to feed my sense of wonder. Over 50 years later, radio is still magic and over 30 years later, Amateur Radio is still the best! This one is of the top side of the circuit board. Everything here is done. I have one last component to mount before entering the final phases of the build and that is T3. If you click on the photo to look at the enlarged version, you will see where I had to remount U11 (the silvery looking rectangular device right above the phone jacks) and the mending job that I had to do to the circuit board at the lower right hand corner of U11. This is the bottom of the board, you can see the BFO trimmer at the extreme left edge, the poly-variable caps as well as L1, T1 (upper left) and L8 through L13 (upper right). If you look closely towards the bottom right hand corner, you can see where T3 will eventually be mounted. I'm a bit tired tonight after a busy day at work and melting some solder to get to this point. I think I will tackle T3 tomorrow night. Now that the "U11 Incident" (sounds like a good title for a WWII U-Boat movie) is behind me and I have the receiver on the PFR3A working, I have really picked up steam. Good progress is being made. I have breezed through the Group 4 section, the Low Pass Filters; and am now into the Group 5 section for the SWR Bridge and the Balanced Line Tuner. When this is over, the circuit board will be completed and final testing and the final wiring can begin. I anticipate this all being done rather soon. Next weekend looks busy with Cara's final cheerleading competition for the season. But between a few scattered weeknights (no more Foxhunts until Summer) and a long weekend for Easter (I get Good Friday off), I should be able to finish this kit up. Hopefully, all will continue to go swimmingly; and I will be able to take this little yellow box out with me for QRPTTF at the end of April. That's the goal, anyway. The entire experience from start to finish will be re-evaluated at the end; but even though things are going well now, this has not been the nicest kit building experience I have ever gone through. I am sincerely hoping that the radio's performance will diminish the negative memories and that the balance sheet will show black ink instead of red when all is said and done. says that QRPers should not call CQ. C'mon ..... you know you've read that in just about every QRP or "stealth" radio book, article or primer that you have ever read. "You are a QRPer, and as such, your signal is weak and will not be heard. Don't waste your time calling CQ". To that ..... I say, "Horse hockies". I was working on the PFR3A this afternoon, winding coils. I switched the K2 to 20 Meters and started calling CQ via the memory keyer. Something to listen to while counting turns of wire being threaded through toroid donuts. I received two answers to my calls; SP6JOE and DL5MC. The conversation with Joe was rather a quickie. A typical "Slam, bam, thank you. Ma'am" exchange; but I did get a 579 out of Joe in Roztoka, Poland. The next answer was from Hal DL5MC from Erfurt, Germany. And this turned out to be an actual QSO! Hal and I exchanged the normal stuff ( got a 559 report); but then ended up chatting for about 20 minutes or so. It was very refreshing to have a QSO with a non-US station that went further than RST, rig info and weather. So the next time someone "in the know" tells you that QRPers shouldn't call CQ, you can tell them that they are selling so much bologna. It works for me - always has; and if it works for me, it will work for you. After not being to a Hamfest for a long time, I really enjoyed myself today. Marianne had to work this morning, so I found myself going with Cara and Joey in tow. I thought perhaps they would dread it and cause me to only stay for nano-seconds, but they were really good troopers. I think even they enjoyed looking at all the "junque" that was there. I bought a few things, nothing of consequence. I bought a cheapie digital clock for the shack. After losing power a couple of times this past week, it was a reminder that AC operated clocks are a pain! The one I bought is of the LCD variety with big, almost 4" (10 cm) digits for the time, date, and year and the ambient temperature! It is not of the "atomic clock" variety, so I can set it to UTC and 24 hour mode. A lot of atomic clocks will only let you choose between EST, CST, MST and PST here in the US, with no provision for UTC. It runs on two AA batteries and will allow me to either stand it up or hang it on the wall. I thought it was a good buy. The other treasure that I brought home; was from a guy who had three huge boxes full of old Radio Shack parts, still in their original blister packs. Each pack was a dollar; and I had the best time rummaging through to see what I could come up with. Some of the things I found and bought were a pack of fifteen 2N3906 transistors, a battery holder for 8 AA cells (12 Volts - great for portable QRP radios! ), alligator clips, test leads, packages of various voltage regulators, and other things. The last thing I purchased was solder wick. The lady selling it was selling 15 foot (457 cm) rolls for $1 each. Compare that to any electronic store! There was one case of "Buyer's regret", meaning "I should have picked that up when I saw it, because it was gone when I went back"; and that was a bug that I saw. It was not a Vibroplex; but it was a clone. It did not have a name plate on it, so you could tell it was a knock off. It was only $45 and I should have picked it up as soon as I saw it. You guessed it, it was gone when I went back to look for it again. I did see some Hams that I talk with on the local repeaters and some Hams that I know through club affiliations. It was great to talk with them and renew old face to face acquaintances. My cell phone hasn't rung so far today; so I guess I didn't win the Hamfest door prize. On the way home, I stopped in at a diner with Joey and Cara for breakfast. Part of the deal was that if they went with me; then they could have pancakes on the way home. It was one heck of a bargain - I got to go to a Hamfest AND I got to spend some great quality time with my kids. It was definitely a win - win situation. In Ham Radio, as we all know, there are a ton of awards to be had .... WAS, WAC, DXCC, WAZ, Worked All Counties and the like. But then there are other awards ..... like "Amateur of the Year", which is awarded each year at the Dayton Hamvention. This year that well deserved award is being given to a Ham that I personally know - Jim Stafford W4QO. 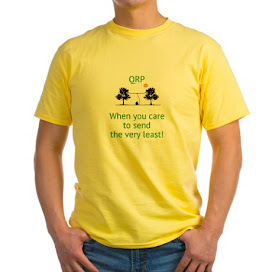 Not only is Jim a great devotee and supporter of all that is QRP; but he is also one fine gentleman. I first met Jim on 40 Meter CW back in September of 2005. We were in a QSO (that was the year I did at least one QRP QSO every day for the entire year) when my son Joey, who was very small at the time started crying in his bedroom. Like any concerned parent, I dropped what I was doing and immediately went to see what was the matter. Joey was having a nightmare and needed some comforting. I sat with him until he fell asleep again and only then went back to the radio. You know what? Jim was there waiting for me! He was concerned by my sudden drop off and stayed on frequency until I got back. Now that is not only a GREAT Amateur Radio op; but also an instant friend. Jim and I have QSOed various times since then. He will always be one of my most favorite people in this hobby. Congratulations on the honor, Jim - you most certainly deserve it! Tonight I managed to find a little spare time and finished up the transmitter section of the PFR3A and have moved onto the low pass filter section - Group 4. It seems a little bit odd to be soldering devices again instead of troubleshooting and looking for answers to problems. I hope to get the Group 4 section done over the weekend. There's not that many passive components to solder in; but there will be a few coils to wind and mount. This weekend looks like a great one weather-wide with highs expected to go above 70F tomorrow. So not only will it be a great day for the Cherryville Hamfest tomorrow; but it will also be a great day for doing some outdoor chores. Maybe raking up the last of the leaves that were wind blown onto my property over the Winter and stuff like that. And hey, isn't tomorrow or Sunday the first day of Spring? Goodbye Ol' Man Winter - don't let the glass hit your ....... backside on the way out the door! I will NOT be sorry to see you exit. Getting back to the topic of tomorrow's Hamfest. There isn't really anything in particular that I need or am looking to buy. A good pair of diagonal cutters, maybe - some solder wick perhaps; or maybe the mandatory little bag of PL-259s. My eyes will always be on the lookout for small project boxes and various odds and ends like that. Maybe a roll of copper antenna wire to replace the G5RV this Spring. It's been up for over a dozen years and I was thinking that maybe an 88 foot Extended Double Zepp might play better on some of the bands. In any event, I'll report back here tomorrow on how the first Hamfest of the season went. For a while it looked like I was going to be skunked on the last night of the 40 Meter Foxhunt season. After the session started at 0100 UTC, I found Craig VE4WI very quickly. There was a lot of QSB; but for the most part, he was loud into New Jersey. But I listened and sent out my call for over an hour with no success. I switched over from the G5RV to the Butternut, thinking that the take off angle of the vertical might improve my chances. However, the vertical was so noisy tonight that it all but drowned out Craig's signal. Then a thought occurred to me. Why not transmit on the Butternut and listen on the G5RV? The "Ant 1/2" button on the K2 would make that so easy! And that's what I did; and within a couple of minutes, I had Craig in the log. New Jersey to Manitoba on 5 Watts - sweet! I quickly headed down to the bottom of Fox territory and easily found Drew K9CW (love that call!). I ended bagging his pelt on my first call, with only 17 minutes left in the hunt. A "Two-fer" to end the season. Sometimes, life is very good indeed. While I was listening and trying for Craig with no luck, I was also melting more solder on the PFR3A. I have pretty much completed the Group 3 - transmitter build section. I performed all the voltage tests, which all came out perfectly. All I have to do to finish the section is to wind and install L7. Maybe beginning tomorrow night I can continue on to to the Group 4 - low pass filter section. Tough night as an 80 Meter Fox. Well, at least the power didn't go out. For the first half hour, everything was perfect. I was handing out pelts left and right - cruising! Then at 0130 UTC a dreaded net came on frequency and once again, the NCS began calling up said net without so much the courtesy of a "QRL?". Do you have any idea what happens to your ears when a 50dB over 9 station suddenly bursts onto the scene; and you're operating with the AGC off because you're listening for weak signals? Painful baby, painful! At that point I had to quit operating split and QSY as I wasn't hearing even the loudest Hounds through that mess. The result was I went from cruise mode into stall mode; and my QSO rate dropped quicker than the proverbial lead balloon. But it was fun, and it was the last 80 Meter hunt for the season. This Thursday will be the last 40 Meter hunts for 2009/2010: and the Summer 20 Meter hunts should start up some time in July to last into September. I hooked up the PFR3A to my battery and went into calibration mode. Once there, I took a test lead, connected it to TP1 and wrapped the wire several times around the meter's telescoping antenna. It was good enough! I was just a tad off from 10. 000 000 MHz; and using the tuning buttons, I was able to bring it to dead on. That's one test done. I will probably try and fire up my antique oscilloscope this weekend to see if I can get the IF Offset adjustment done. I saw a T-shirt recently that said, "If necessity is the mother of invention; them MacGyver must be the father". I need to get one of those. On the other hand, I came home to find out the power was out again. It was sunny today and the bad weather has all cleared out; so I have no idea as to what that was all about. The thing that has me a bit nervous is that I am one of the 80 Meter Foxes in tonight's Foxhunt. It's the last one of the season; and I do not need to have the power fail in the middle of it. I can hook up to my 12V lead acid battery easily enough; but I don't relish the thought of operating in the basement by candle light. I will have the battery, cable and candles on hand in case they are needed. At the end of the Group 2 build, there are several calibrations that can be done, providing of course, that you have the proper test equipment. These include the reference frequency calibration, the IF offset adjust and the BFO adjustment. To perform the reference frequency calibration and the IF offset adjust you need a good frequency counter and a good oscilloscope. I have both; but neither are very good. My oscilloscope is an antique that someone gave me. This boat anchor has to date back to the 50s or the 60s. I suppose I might try the IF offset adjustment this weekend; but I'm probably better off passing this by. The reference frequency calibration requires a good frequency counter. I have a small Radio Shack job that I picked up used - I can't even remember where. It's not really that good; or that accurate, I suspect. Again, I will probably pass by this adjustment also. Both of these are there to make if you have the equipment. If I don't, I suspect that I will be "close enough". The BFO adjustment was easy. All I needed was my ears; and even these old ears were good enough to match the pitch of the side tone and the BFO beat note. On to the Group 3 assembly (the transmitter section) next! Note to self: Start buying lottery tickets so as to be able to afford fancy test equipment. I just had to go down to the basement to hook up the PFR3A to the antenna again, just to listen to 40 Meters for a while. I am so happy that it is working now .... you have no idea! It's going to take a bit of getting used to using push buttons for tuning instead of a dial. I like the cool little noise the signals make as you pass them by while holding the "up" or "down" buttons pressed. I have tweaked C1/C2 for loudest signal reception. I will try and figure out how to get my "not so great" frequency counter hooked up to do the calibrations, if I can. I will also try and get to the BFO calibration, which can be done by ear, soon. Looks like Tuesday night might be the earliest. So far tomorrow night and Wednesday night are booked with various meetings. While I was tooling around with the PFR3A, I kept the K2 on and did some dial twiddling. In the process, on 17 Meters, I managed to work David MIØSRR. David lives in Northern Ireland, near Belfast. I've worked Northern Ireland before; but not with QRP, so this was a "new one" for me and brings me up to 104 via QRP CW. What holds even more significance, on a personal level, is that David's QTH is probably not too terribly far from where my mother-in-law was born and raised. Marianne's mom is from Donegal in Ireland which is about 100 miles or less (as the crow flies) from Dromore in Northern Ireland. This QSO was made with the K2 at 5 Watts (of course) and the Butternut HF9V. David was booming in to New Jersey with an honest 599. I got a 579 back. 40 Meters is open right now; and I am hearing a lot of Hungarian and French stations. PFR3A success (for a change) !!!!! A few weeks ago, I received the replacement 50 MHz clock oscillator chip from Dan Tayloe N7VE, for my PFR3A. I soldered U11 in; and was disappointed with still no receive signals on 40 Meters. All the voltages were now more or less correct - due to the tolerance of my VOM, they're a bit off from the PFR3A manual; but they were right in the neighborhood. It's not likely anything else is damaged. 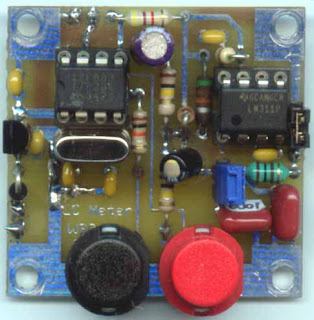 Make sure you did indeed make good connections to the clock chip, they can be tricky. If you have a scope, you can check to see if your getting the 50 MHz clock signal out of the chip, down in the lower right corner. I was going to play around some more; but then, the power went out as I posted earlier. So this afternoon, I went down to see what I could see. First thing I did was to yet again check the solder connections from the clock oscillator with my Ohm meter. From each corner of the chip, I received a gratifying "beep" telling me that I had connectivity. But I figured that "The Designer" must know what he's talking about; so I gave each corner another hit with the heated tip of my iron. I hooked up the circuit board to my 12V SLA battery; and ran two jumpers from my Inverted L's feed line. I really didn't expect anything; but ..... lo and behold! The sweet tones of a CW signal greeted my ears! And what was even more beautiful and gratifying was when I fired up the K2 to find that the frequency read out for the K2 and the PFR3A were spot on! The only thing that I can guess as to what was happening was that I didn't have a good solder connection at U11; but when I pressed down with my Ohm meter probes, it APPEARED that I did. Doing the actual re-heat (again) finally made a good and very necessary electrical connection. So right now, I feel like the contented cat that ate the canary. I am doing the happy dance (big time) knowing that A) I haven't wasted the money that I have spent on this kit; and B) that with some help, I was able to overcome this obstacle. From this point, I can continue onward - after I bask in the success for a few moments. Thanks to Steve Weber KD1JV, Dan Tayloe N7VE and Bob W3BBO for their help, guidance and encouragement! Yesterday was another one of those great meteorological days. It poured - "cats and dogs" poured ..... Biblical "Noah's Ark" poured! It started raining early in the morning and didn't finish until sometime after Midnight. And the wind was awful. I had to take my son Joey to a birthday party yesterday afternoon at an indoor roller skating rink in a neighboring town. As we ran in from the parking lot, my BlackBerry, which hangs on my belt got so wet, that I had to take it apart (i.e remove the battery and the back cover) to let it dry out in order to get it to function. Also, on the way back to the car, as we were leaving, the wind blew so hard that we were literally pushed along by it's ferocity. In the process I lost my beloved 2009 ARRL Field Day cap. The last I saw, it had taken off from my head like a kite and was blowing somewhere towards the direction of Staten Island. There were tree limbs down all over and somewhere in the neighborhood, one came down and took a power line with it. We had no electricity from about 7:15 PM last night until about 5:00 AM this morning. Of course, without electricity, the furnace won't ignite; so we also had no heat. When the lights came on at 5:00 AM, I got up to turn everything off around the house. I took notice of the thermostat and saw that the temperature in the house had fallen to 58F (14C). I heard somewhere that we got over 3 inches (7.5 cm) of rain last night. The good thing is that it was warm enough that it wasn't snow - that would have been over 30 inches (75 cm) worth, had it been the white stuff. The other good thing is that my antennas are still up. No tree limbs brought down the G5RV and the wind wasn't strong enough to knock over the HF9V. After the power went out, I considered putting the K2 on battery and operating without the usual local electronic RF pollution. However, my wife was working and my daughter was at a classmate's house for a sleepover; so it was just me and Joey in the house. It would not have been a good thing to leave him alone in the dark while I selfishly played radio in the basement. We made it through our little "power failure adventure" together. It was posted on the QRP e-mail reflectors that a bunch of QRPers were headed up to Cape Cod to activate the Marconi site at Wellfleet as Special Event Station W1M, tonight and tomorrow. Tonight was supposed to be dedicated to operations on 160 Meters and 80 Meters. The DX Clusters show them on 160 Meters (which I don't have installed yet - my fault!) and on 30 Meters. I thought they were going to be on 80 Meters where I thought I would have a good shot at working them. I really like Wellfleet. I visited there soon after getting my ticket way back when and I have fond memories of my time spent there. I don't see how people do it. Call it envy, call it wonder, call it what you will. I was listening to the local VHF repeater on the way home and was listening to a few guys discuss their latest plans to purchase new HF gear. And these guys weren't buying to replace boat anchors. These guys are replacing state-of-the-art radios they just bought a couple of years ago. My question is ..... how do they do that? I must truly be poor or overly frugal or something (cheap! ); but in my 30+ year Ham career, I have never changed rigs like I change my socks, shirt or underwear. My K2 is going on six years old this year. I had my Icom IC-751A for a decade before I parted with it. Before that, I had my Heath SB-104A and an Icom IC-730 for over ten years. I will admit that I had my Novice gear for only a few years before I built the SB-104A. I guess for some, a fun part of this hobby is to horse trade equipment. I guess that's just not my style. But I sure wouldn't mind if a K3 happened to fall off a UPS truck and landed in my lap! I'd never get rid of the K2, though. I made THAT mistake by selling the SB-104A and my HW-8. If I had to do that all over again, I wouldn't. In my experience, there's something regrettable about parting with a piece of equipment that you built with your own two hands. You have a history together. Maybe I'm just corny and overly sentimental. I sure wish I had the financial resources to even consider doing it, though! and good weather are an exciting combination. Please read Jim W1PID's latest QRP adventure. The past few days have been gorgeous here in NJ, too. Highs have been in the 50s and the snow from just a week ago is now just a memory, pretty much. There are a few patches here and there, especially where it was plowed into piles in parking lots; but for the most part, it's all gone. In fact, yesterday, I saw the first few robins of Spring on a neighbor's lawn. The iris plants on the side of the house are looking less wilty and more robust. They won't bloom until late April or early May, perhaps; but you can tell they are on their way back. And for me that means that portable QRP season is sooner rather than later. We have QRPTTF coming up in late April and my thoughts are more and more concentrating on another wonderful season with the K1 and the Buddistick outdoors in the warm sunshine. This season, I plan to experiment with some end-fed antennas, also. The quicker the set up, the more time for operating, which is the "Main Event", so to speak. Hooray for Winter coming to a close! I know we can still get some cold and messy weather; but we're over the hump now - we even move the clocks ahead one hour this coming weekend. From Winter to Spring in a week - how about that? And if that's all I can think to write about; I must be tired! Some random and disconnected thoughts ..... all I keep hearing and reading about is this newly designed, super duper neat and slick "new" ARRL Website. When's that supposed to happen? Looks like the same ol', same ol' to me! The more I think about this situation with my PFR3A, the more steamed I get. I should inquire as to the possibility of a new kit; but I suppose the snowball in Hell stands a better chance. Anybody wanna buy it? I'm tempted to sell it, as is, for half of what it normally goes for just to get it out of my hair. Next time, I'll spend the extra money and go for a KX-1. At least Elecraft KNOWS how to manufacture a kit. Got the latest "Keynote" from FISTS with Nancy Kott on the cover in color. I see she stepped down from the Editor's post at WorldRadio Online; and that Richard Fisher KI6SN, is now head honcho. I guess that means his blog will get updated even less often now. My daughter, who is in 3rd grade, came home with a 100% on her test on the phases of the moon. I think that back when I was in 3rd grade, all us kids still thought the moon was made of green cheese. The 2 Meter repeater that I've been hanging on lately during the commute to and from work? I was extended the invitation to join; and the club President told me to mention him as my sponsor. I thought that was cool. Argh! It's March and I still haven't sent in my GQRP dues! I have to do that this weekend. It's a good thing today was payday. When people ask me if I have a good paying job, I tell them I get paid weekly - VERY weakly! I got a notice in the mail yesterday about the 35th reunion of my high school graduating class. A ticket is $89. For that amount of money it had better be darned good rubber chicken. "Hey, did you ever get (Jobs A, B, and C) done ? We need those for tonight!" And so on and so on and so on. Through lunch - "What's that?" And for 3 of the 5 days, into the evenings. I'm pretty sure that this is Friday evening; and that I am done for the week. I have my fingers crossed that the cell phone won't ring! What I am feeling right now, can literally be described as "shell shock". I am used to being extremely busy; but this was pure insanity. There was so much work and data flying around; that I can only hope and pray that something critical didn't get lost in the sauce somewhere. This weekend; I have a bunch of family commitments; so there really won't be any time for radio. Maybe next week. By the way, you may have noticed that I added a new blog to the blogroll tonight. It's called "The Garage Shoppe"; and you might find it interesting. 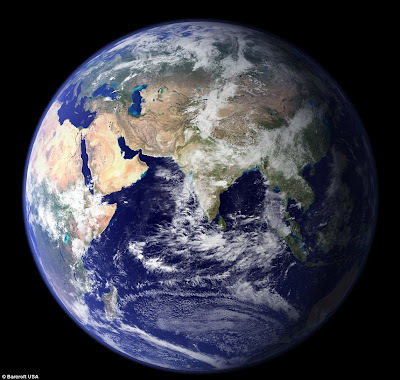 These images have been released by NASA, taken with the Terra satellite. For more information, you can read about it here. To think that my itty 5 Watts has spanned these distances is truly mind boggling! Also, without getting preachy, these pictures serve as good reminder as to how precious our home is; and that we should be good stewards in taking care of it. You don't have to go overboard in order to be a good and faithful caretaker. As I thought it would be, so far it has been a really difficult week at work. Back breaking and exhausting, preparing 488 - 60 pound servers for install this weekend. I've been coming home late and tired. Tonight however, is a small respite - the 80 Meter Foxhunt is on tap. And as March begins, we are racing to a close of the 2009-2010 Winter Foxhunt season. I have not been fantastically successful; but it has been a lot of fun. And ideally, that's all you can realistically hope for. Maybe the Summer season 20 Meter hunts will be more fun than the past couple of years, now that Cycle 24 is slowly starting to come to be. As a break from the usual, I actually picked up the microphone on the VHF/UHF radio in the car and had a couple of nice conversations with fellow Hams, instead of just listening for a change. It felt odd to repeat my callsign for someone and to use phonetics. You never have to use phonetics with CW! It was a nice change of pace; and I will have to do it more often. I actually found myself handing out some advice to a couple of newbie Hams, also; so there was some value in addition to the company and entertainment I received. Lastly, here's an interesting article I read on Yahoo today. The Chilean earthquake actually shifted the Earth's axis - and shortened the length of a day by 1.26 milliseconds. Now, please don't tell me that you noticed it - I'm not buying it!